In this short video, we’ll quickly review some highlights of Exclusive Concepts, including accolades, services, brand promise and company values. Exclusive Concepts is the leader in do-it-for-you ecommerce marketing services. Exclusive Concepts would like to thank our clients for their continued patronage — because of you, we have continued to rank on the INC 5000 every year since 2008. We’re proud to be based in Boston, recently ranked by a leading national publication as the smartest city in the United States. 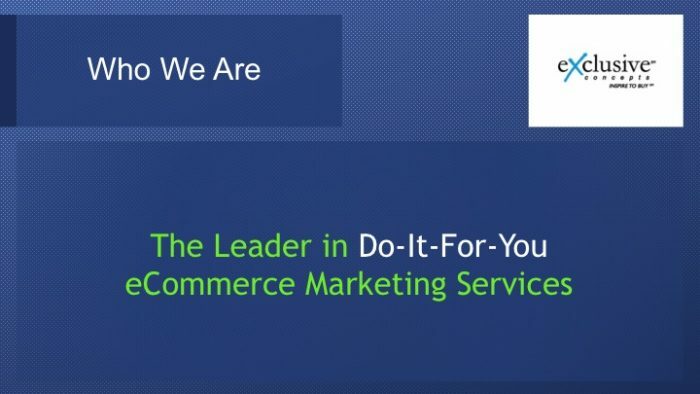 Knowing who you serve improves every aspect of service; at Exclusive Concepts, we cater our services to ecommerce stores that earn over $1 million in annual online sales and spends over $10,000 per month in combined online marketing efforts. In a recent survey, our clients ranked what they value the most from our service: At #4, they appreciate that we help them focus on, and grow their revenue through our marketing efforts. Coming in at #3 is the ability to compete better, especially when it appears that competition is insurmountable. #2 was the quality of our team and the numerous people they interact with. And topping the list at #1 is the fact that we really help save our clients time and energy; no baby-sitting required. And so, our promise is to continually optimize towards these things our clients value the most: saving them time, growing their revenue, and building their dream team here at Exclusive Concepts. Each quarter, we launch new initiatives to further deliver on this promise. The people you work with matter just as much, if not more, than the reputation of the company itself. At Exclusive Concepts, our culture is forged in deeply shared values. Values such as “Seek the Positive”, which is defined by being kind and spreading kindness, ensure that our clients have a pleasant, forthright and engaging experience with us. Advanced SEO: On average, the top 1,000 keywords in your industry only represent 11% of your organic traffic. We’ll help you target thousands of keywords through our unique, ROI-driven long-tail approach to SEO. Profitable PPC: Agencies are not keeping up with changes in Adwords and BingAds — and even more so, on innovation. Our program helps you take advantage of every available public tool and many in-house ones as well! Profitable Google Shopping: Google Merchant connects with Google Adwords, and then what? Treating all products equally is inefficient. We’ll help take your Google Shopping program up many levels to spend and target in the most profitable way. Conversion Booster: There are two ways to lose with a conversion optimization program: (1) bad ideas, (2) limited data. With Conversion Booster, we’ll help you test the best ideas on a platform that will calculate true validity. SMB Email Marketing: Email marketing campaign services are either too lazy and make you do the work – or far too expensive. Starting at $395 per send, our program is best-of-breed and full-service — at a fraction of the cost. Thank you for watching this video — we hope you take the opportunity to reach out to us. To help identify whether our services are a good fit for you, we will work with you to understand your business, analyze available data and help create a strategic marketing plan that fits your needs and the unique factors of your business. Not every service is a good fit for every online retailer, so please expect a little pushback and a whole lot of honesty.